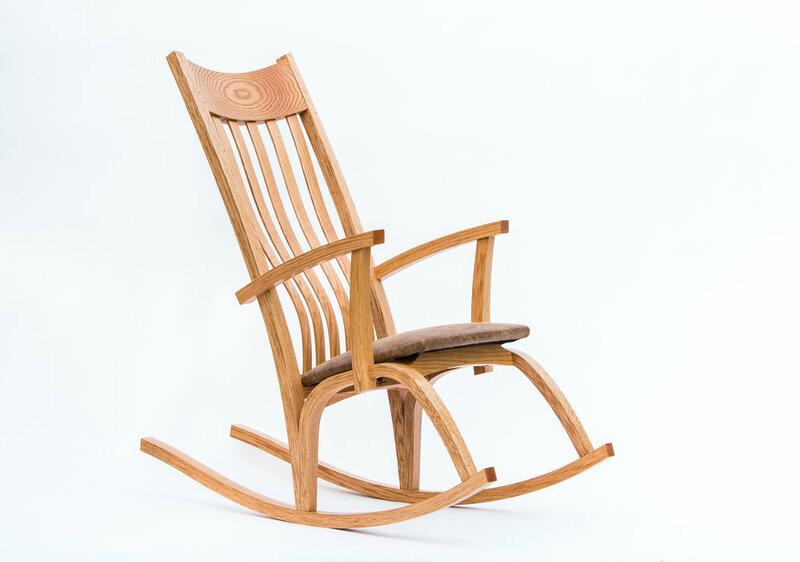 Bent Lamination rocking chair for book reading, relaxing, and expecting mothers. Made from just over 170 pieces of solid and laminated pieces of wood, The Randall Rocker is a functional piece of art. The seat pad is made from high quality medium density foam and topped with cotton batting. When you sit down the cushion adds support without bottoming out and will keep you comfortable for hours. The braces are designed to mimic the curvature of the back. They are made up of 4-5 thin strips laminated together with special wood glue. This allows the back braces to bend and flex with you as you lean into them, creating a perfectly comfortable fit every time. The arm rests have a gentle bend in them that offer support from back to front. They are at just the right height for relaxing back, reading a book, or rocking a child to sleep. The rocker’s radius opens up towards the end of the rock to soften the ride. A gentle reverse curve has been worked in to prevent the chair from tipping too far back. The lower leg joinery in the chair is called a scarf joint. The joint gives a large gluing surface making it an extremely strong joint. Dominoes were added into the joint to help with alignment during assembly and add additional strength. The arms help anchor the rear and front legs together with tight fitting half lap joinery. The only metal fasteners can be found underneath the chair, holding the seat pad to the frame. Four stainless steel hex cap screws are countersunk into the frame and secured in place by 4 brass inserts on the seat’s underside. Rear look at how the chair tapers from back to front and top to bottom. Outer edged are all straight and insides all taper.